The basic idea behind the Vonage Mobile for Facebook application is fairly simple. The application allows users to make phone calls from their iPhone, iPod Touch, or Android mobile phone to any one of their Facebook friends who also have the application installed. Phone calls are made using the phone’s 3G or Wi-Fi connection, allowing users to make calls without using any minutes from their mobile phone plan. One feature of the Vonage Mobile for Facebook application is that it does not require you to have your friend’s phone number in order to place a call to him or her. Your entire Facebook friend list is listed when you launch the application, with a list of those who have Vonage Mobile for Facebook installed listed at the top of the screen. Being able to call anyone on Facebook can be a great way to connect with friends whose numbers you may have misplaced. The service, however, can also be an issue for people who may not want some Facebook friends to have the ability to give them a ring. As long as you have the application installed on your phone, then you’re giving the green light to receive calls from any of your friends. Vonage Mobile for Facebook makes phone calls over data networks rather than through traditional phone lines. Calls can be made with phones that are connected to 3G networks as well as those connected to Wi-Fi. On the surface this is a pretty great feature. Especially when connected to Wi-Fi networks, you can make phone calls for free, without having to use your mobile minutes. Where the service is going to start becoming trouble is when you make calls connected to the 3G network. Calls made through 3G will be using data from your wireless data plan, whatever that may be. While many people have unlimited data plans, others do not and could very easily run up sizable overage charges on their plans by making phone calls. 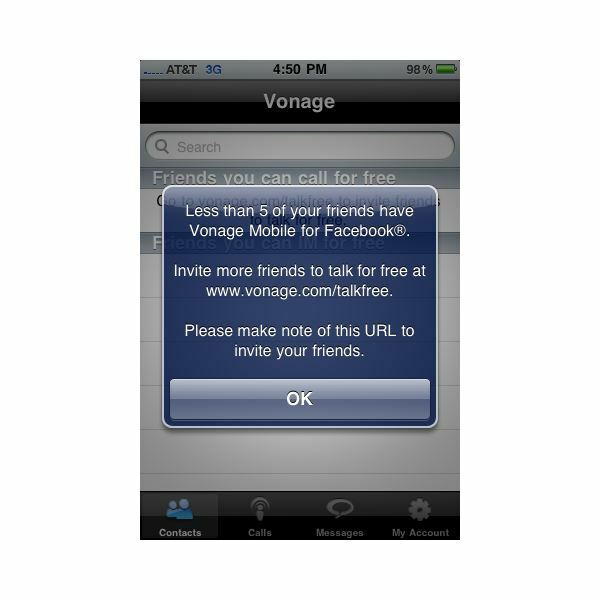 Vonage Mobile for Facebook only allows you to call those friends who have installed the application on their mobile phone. If your friends do not have the application, then it is essentially useless to you. If a user simply has the application installed on his or her phone, however, they can receive phone calls at any time, with a notification window showing up on their phone screen letting them know about the incoming call. Vonage Mobile for Facebook is a great application for those who also have friends with the application installed, and who have regular access to unlimited 3G data or Wi-Fi networks. Those who have limited data plans, or who do not have very many friends using the application, will find they have very little use for it.